I have posted my machine on here a couple times and kept promising that I was going to get it to the point where I would have plans ready for it. This has turned out to be a very daunting task . At first glance of the machine it does not look too overwhelming. But, when you break it down there are many many parts and details to make this thing work the way it does. Before I go any farther though there is one person on here I want to thank for all the help . I would not have gotten this far without his help. Dan Krager is a very accomplished and talented man and he has put many hours of his own time helping me with the sketch up drawings and other parts of it. His original interest in the machine put us in contact because he is intrigued with it himself. 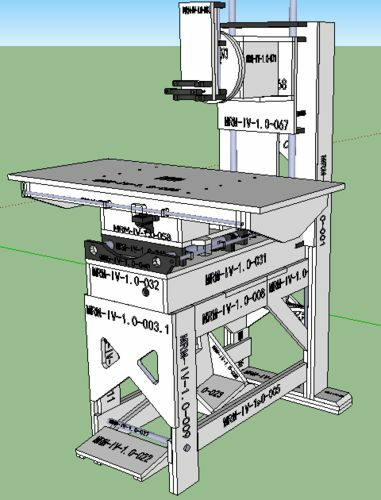 When I first built the first machine a little over 5 years ago I knew it was a neat machine but over the period of time of using it and becoming familiar with the characteristics of how to use it I realized how much potential it has. I have been asked by some as to why anyone would want it except for maybe a novelty machine. While there are machines that can do some of the things this machine can do, this machine can take many projects to the next level with its versatility or make some projects safer. Making perfect round circles without a center hole. Cutting out or milling small objects without putting fingers in danger. I have put together a kit with plans and am just about ready to launch it. Pricing was tough for me there is a ton of little parts that just add up in this thing. Grizzly had a machine that they sold for a short time for right at $4100. 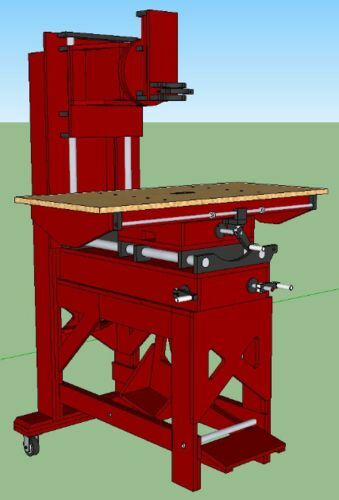 Granted this machine may not be as heavy duty but it has a bigger table, bigger movement and my machine is more geared toward using it for wood instead of a converted metal milling machine. Things such as faster movement with the handles and larger work surface all make it more versatile. With all the parts, hardware and lumber this can be build for just under $600. Router not included . 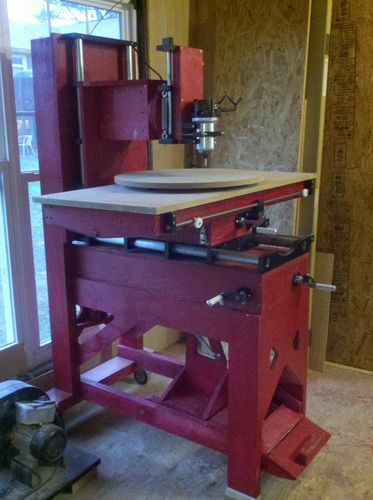 My goal was to be less then that, but as good as this thing works that’s a deal and could be a great addition for some woodworkers. Congratulations Mark, it looks great. I saw the 600$ figure for all the parts and wood but what are you asking for your plans and parts? Did I miss it? 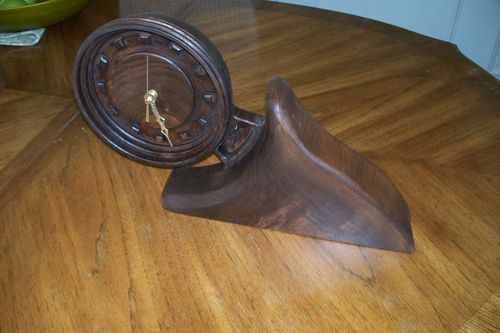 When I built the one in the picture I paid local retail prices for everything and my cost was much higher. I have since found many suppliers that I can get much better pricing. So my goal for the kit was to provide all the hardware and build the intricate parts. The plans will come with the kit and the only thing a builder will need to buy is the plywood glue and fastener for the frame. I am finalizing everything up but I hope to put that together for around $500. The wheels are not part of the kit, right? I was looking for sharp and fast router for Walnut wood milling, Hope this works for that also. Yes Casters are a great benefit. The machine is very heavy complete and they are not part of the kit. It mills walnut very well. 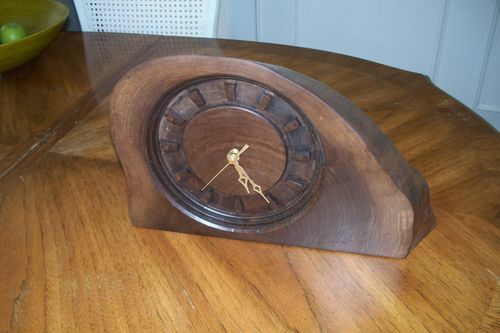 Here are a couple examples of some black walnut pieces I milled into clocks a while back. Sell ​​construction plans? I’m interested in building it, but in a slightly different.